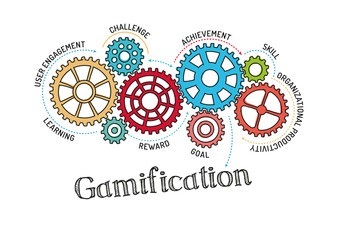 Gamification is the process of using games to engage or educate people in a traditionally non-gaming environment. By using the same mechanisms that make good games compelling to play — principles such as reward, fun and development — the theory is that you can encourage people to do things differently. The ideas that underpin gamification are not new. The theory has long been used by companies to keep customers coming back — it is hard to go into a store and not be offered some kind of points-based loyalty card or the promise of your 10th coffee for free. However, as well as using the methodology to retain customers, organisations are also harnessing the power of games to engage employees. With its success often driven by behaviour change, sustainability is an obvious target. The psychology of why we need to break larger problems such as climate change into bite-size pieces has been well documented, and the reasons largely fall into three categories. First, the thought of “saving the planet” is often too big — we naturally put up defences against things that we feel we cannot influence, preferring to focus on the here and now. Second, we are programmed to disengage from topics that are all doom and gloom. Impending disaster is simply too scary to think about, especially if it seems a long way away. Finally, often the things that we know are bad for the environment are things that we are doing in our day-to-day. This makes us feel uncomfortable, and so we make excuses to justify our behaviour. As a result, very little changes. As well as being fun, gamification can help break many of these psychological barriers. For example, by encouraging small actions and providing feedback, people start to feel that they are making a positive impact, however big the larger problem. Furthermore, no longer is the narrative one of certain disaster, instead it becomes full of success stories that end up the usual tale of environmental tragedy. Finally, by encouraging certain tasks, gamification can “nudge” behaviour in the right direction. Eventually these new behaviours become the social norm, and as this new “normal” sits better with what we know we should be doing, the behaviour is much more likely to be cemented. Take disposable coffee cups for instance, something that is clearly bad for the environment. It is all too easy to slip into a routine of buying a morning coffee, often feeling bad about using a disposable cup, but then telling yourself that maybe they are not as bad as all that if they are still being sold and that, anyway, no-one else in the queue has a reusable one. Nothing is likely to change, or at least not very quickly. Now imagine that you are on a team challenge, and that every throwaway cup saved earns your team a point. Now you are much more likely to get a reusable cup — and use it. After all, you cannot let the finance team win everything! Soon, you know much more about the impact of disposable coffee cups, you notice other people using them and remembering to take your cup and getting a discount for using it becomes normal. On the days you do forget, the coffee seems overpriced, and the disposable cup a terrible waste. Link the activities to clear objectives — it is easy to measure a lot of activity, but be sure to know what the programme actually achieves when considering the big picture. Consider how people engage with the programme over the long term — for example, gamification will be much more successful if it helps people achieve their own goals, and it is important to find the resources to keep the scheme interesting after an initial campaign. Carefully consider design — if employees are demotivated (for example by always appearing at the bottom of a scorecard) or rewards are too easy to win, then after an initial spike, participation will drop and efforts are likely to be wasted. In January 2018, Bournemouth University (BU) rolled out their Green Rewards scheme, a bespoke programme developed in collaboration with Team JUMP, to its 2000 staff. At its core of the scheme is the concept of gamification. Specifically, employees score points when they complete an activity, which enters them into a leader board showing how they are competing in relation to their colleagues and other teams in order to win prizes, such as gym or bus passes or vouchers for national shops. The scheme has been widely recognised as having a positive impact, including being nominated for an edie 2019 Sustainability Leaders Award. However, it is not without its challenges. “Initiating long-lasting behavioural change and maintaining engagement are continual challenges we face running the programme.” said Dr Neil Smith, Sustainability Manager at BU. To combat this, the team took a number of actions, of which one of the first steps was running a trial. “We used the pilot and the feedback from participants to develop the approach for the roll-out.” commented Dr Smith, adding that he worked with a small team from across the University to oversee the implementation of the platform and to make sure that it met expectations. The trial was also key for building support: “The outcomes from the pilot were constructive in helping me secure support from senior managers for the programme” said Dr Smith. Indeed, in terms of high-level objectives, the scheme is also very well integrated, supporting both the University’s BU2025 strategy and Sustainability Policy, as well as the institution’s commitment to the United Nations Sustainable Development Goals (SDGs). Continual development has also been crucial to the scheme’s success along with understanding the audience and what motivates them. “The Green Rewards team are extremely responsive in adding items to the platform and that keeps interest and engagement levels up” he said. In terms of popularity, there were a few clear winners. “Our M&S vouchers often prove the most popular choice and appear to really drive the competition” noted Dr Smith, adding that the data was currently showing that members of the scheme were particularly focused on sustainable travel and recycling. Although the scheme has only been running for a year, Dr Smith is positive. Over 44,000 sustainability and wellbeing actions have been taken covering activities such as commuting, energy saving and recycling. These actions have saved over 87,000kg of CO2. But has gamification changed behaviour? According to the feedback, an impressive 70% of participants feel they have improved their sustainability behaviours at work. For BU, it’s certainly Game On for the Green Rewards scheme. Gamification can encourage positive behaviour changes. obtaining management buy-in and making sure that there are clear links to the university's high-level strategies. This means that there is both support and the resources available to develop the scheme and the ongoing work of the sustainability team.